• year 13. • 2018 No.4. The Health and Social work is a peer reviewed journal that publishes original articles in public health, social work, nursing, laboratory medicine (diagnostic methods) and pedagogy (paedeutics). 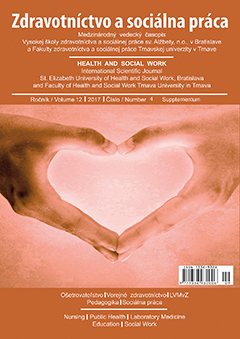 The Health and social work publishes high quality, original papers that contribute to the methodology of research in health and social work. The Journas was founded more than 12 years. Professional journal was established in 2005 at the Faculty of Health and Social Work of blessed P.P. Gojdič in Prešov, St. Elizabeth University in Bratislava. Professional journal has gradually developed based on the quality of contributions to the scientific and professional journal.